Made of durable acrylic, these convenient embryo collection cages feature an extended end cap (flexible LDPE) which accommodates a petri dish (35mm, 60mm, or 100mm). This unique easy-to-use feature eliminates the need for tape, while maintaining cage integrity. Stainless steel mesh (97µm) is fused to the top of the cage to allow ample breathability and eliminate condensation. Embryo collection cages must be cleaned with cold soapy water. Do not clean with ethanol or other alcohols. Click Here for our embryo collection cage plate compatibility guide. 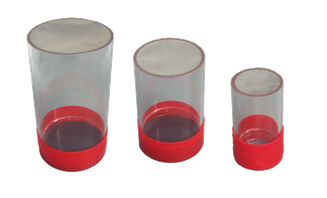 Our Drosophila population cages feature cylindrical extruded acrylic for a corner-free interior. The durable custom sewn cloth end caps (machine washable, drip dry) are form-fitted and held tight by adjustable hose clamps. One end cap features extended netting for easy, safe access. To close the fly cage, simply tie the netting in a knot. The cage sits securely on a durable plastic cradle. Complete unit (pictured) includes acrylic tube, fitted cloth end caps (one with netting for entry), hose clamps and tube cradle. The Fly Condo features 24 independent chambers, each connected to one another in a single, easy-to-handle cluster. This unique design allows the researcher to conduct 24 different experiments simultaneously under identical conditions. The Fly Condo can be used for high throughput collection of Drosophila embryos and/or processing of a variety of tissues for immunohistochemistry, in situ hybridizations and DNA staining. Thus the Condo is an excellent tool for genetic screens where phenotypes can only be visualized by embryo or tissue processing. The Fly Condo can also be used for whole-organism drug screening where chemical compounds are fed directly to larvae or adults. The Fly Condo footprint (8 x 11.6cm) fits on top of the FlyStuff™ CO2 Flowbed or most other rectangular CO2 staging apparatus, thus facilitating the addition of flies to each of the chambers and/or subsequent collection of adult flies from the chambers. Both the 24-well Stainless Steel Mesh Plates and the 24-well Food Plates are made of durable HDPE for resistance to most organic solvents, bleach and acids. Seal Plate polyester-based adhesive sealing films can be used for plate storage. Our protocols can easily be modified in order to fit your particular needs. ** Fly Condo Trays are pipet tip tray lids which come with the following MBP Pipet Tip Trays: ART 10, ART 10 Reach, MBP 10, MBP 10 Reach. Genesee Scientific is a full-line MBP Distributor. Made of durable PVC, these threaded baskets are quite handy to make your own mesh sieves. We buy them at the hardware store to make them available to the Drosophila research community as a convenience.